dance.net - Premier Jig outfit. (10244509) - Read article: Ballet, Jazz, Modern, Hip Hop, Tap, Irish, Disco, Twirling, Cheer: Photos, Chat, Games, Jobs, Events! Locked by sunkst (137606) on 2017-01-29 17:35:31 item is sold. Skirt, apron cummerbund are brand new and never worn. Blouse has been worn a couple of times. 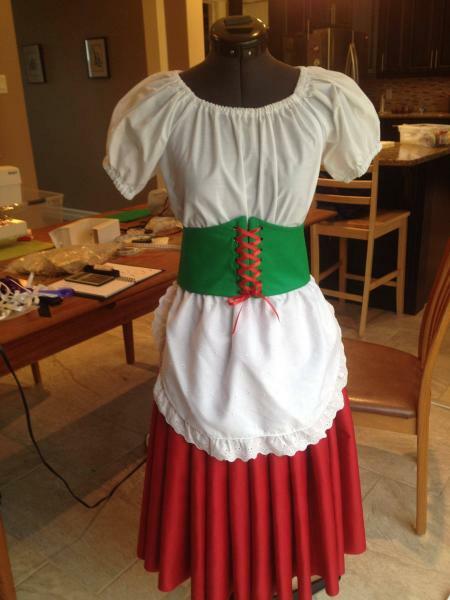 All separate pieces (no underskirt). Skirt easily adjustable button closure. Currently 23" waist (can adjust to 26" by moving buttons), 22" long with 3' hem. Velcro closure on cummerbund. Manikin here is at a 30" bust. $100. Buyer pays shipping. 1 Replies to Premier Jig outfit. Interested where is shipping from?